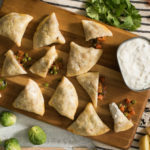 Flavoured with store-bought curry paste and wrapped in prepared pie dough for easy assembly, these harvest-inspired samosas can be packed for lunch or served as a light dinner, appetizer or snack. Samosas: Preheat oven to 400˚F (200˚C). Heat coconut oil in large skillet set over medium heat; cook onion, garlic and ginger for 3 to 5 minutes or until softened. Stir in potatoes, squash, carrot, salt and pepper; cook for 8 to 10 minutes or until vegetables are tender-crisp. Stir in Brussels sprouts, curry paste and garam masala. Cook for 3 to 5 minutes or until Brussels sprouts are slightly softened. Stir in peas; cover and cook for 2 to 4 minutes or until vegetables are tender. Stir in cilantro. Let cool completely. Beat egg with 2 tsp (10 cm) water. On work surface, cut out six 6-inch (15 cm) rounds from pastry, rerolling scraps as needed. Cut each round in half. If pastry becomes too soft to work with, freeze for a few minutes. Working with one at a time, brush straight side of semi-circle pastry with egg wash. Form into cone shape, pressing straight edges together to seal. Cup cone in your hand; spoon in enough filling to come 1/2-inch (1 cm) from top. Brush inside edge of pastry with a little of the egg wash and press together to seal cone. Place on parchment paper–lined baking sheet. Brush pastry with remaining egg wash. Repeat to make 12 samosas. Bake for 15 to 18 minutes or until golden brown; let cool for 5 to 10 minutes before serving. Yogurt Mint Sauce: Meanwhile, stir together yogurt, mint, lime juice, garlic, cumin, coriander, salt, pepper and cayenne. Serve samosas with sauce for dipping. Substitute BCfresh kabocha for butternut squash if desired. Freeze baked and cooled samosas in an airtight container for up to 2 weeks. Reheat in microwave or toaster oven from frozen until heated through.